This mulit faceted, 3 in 1 Cleansing System is designed to detoxify and cleanse the skin, while providing resurfacing benefits by polishing the skin to a new level of radiance, all within a few minutes everyday. Reduce the signs of ageing naturally. Deliciously refreshing and gentle, yet thoroughly cleans and rebalances the skin. 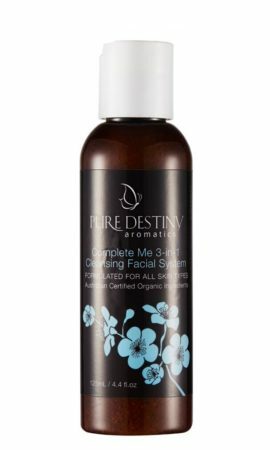 Our "Complete Me" Organic 3-in-1 Facial System contains ultra-fine Organic French White Clay to gently and safely help deep cleanse and detoxify the skin, leaving it feeling energized, refreshed and radiant without dryness. Organic Oilve Oil and Violet Leaf Absolute is rich in essential nutrients and anti-oxidants to soothe and protect the skin from cell degeneration. Potent Essential Oils help nourish the skin and simulate circulation and cell renewal. So gentle you can use 3-4 times per week. For all skin types. Massage gently over face, neck and décolletage. Allow to remain on the skin for 3 to 4 minutes to active detoxifying and cleansing properties of our unique formulation. Rinse well with warm water and soft face cloth. Tone with one of our Blossom Waters and moisturise with our Organic Youth Nectar.